Wide receiver Janarion Grant announced he will return to Rutgers for his fifth year Tuesday in an announcement on his personal Instagram account. It’s been a rough few days for Chris Ash and his Rutgers football team. They saw assistant defensive backs coach Aaron Henry leave the program, the third assistant to leave the program this offseason. They saw a highly-touted prospect from each of the next two recruiting classes — Bryce Watts of 2017 and Trill Williams of 2018 — decommit from the program. And while they had one of the key pieces of the 2017 recruiting class Bo Melton reinforce his commitment to the program, it came with a warning that he considered joining Watts and Williams. It isn’t unusual for recruits to second-guess their decisions, but with a number of current commits doing some last-second window shopping with official visits to other schools weeks removed from National Signing Day, it looks like Melton wasn’t the only one. The Scarlet Knights needed good news to escape the cloud of negativity surrounding them for the past couple of days. They got it in a big dose Tuesday. 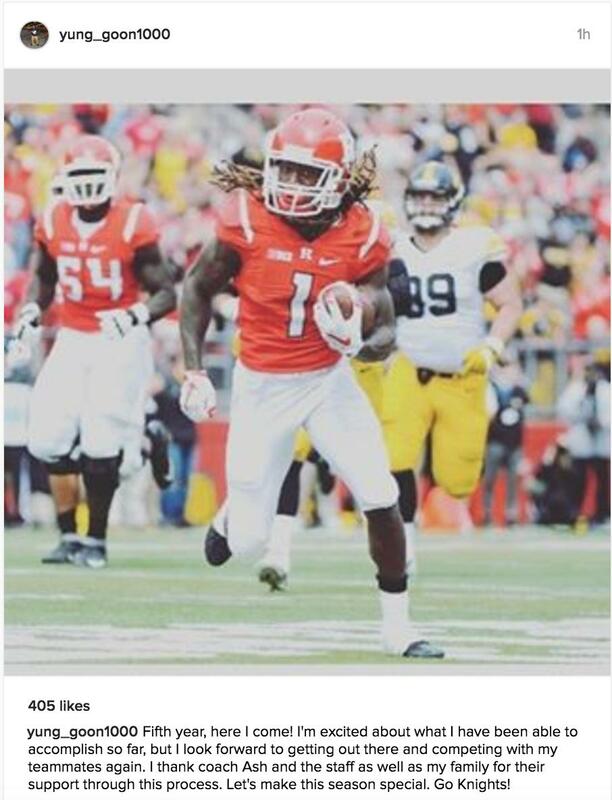 Offensive Swiss army knife Janarion Grant announced he’ll be returning to Rutgers for his fifth-season on the Banks, he announced in a statement on his personal Instagram account. He was granted a medical redshirt by the Big Ten following a season-ending ankle injury sustained in Rutgers’ Big Ten opener against Iowa on Sep. 24. "Fifth year, here I come! I'm excited about what I have been able to accomplish so far, but I look forward to getting out there and competing with my teammates again. I thank coach Ash and the staff as well as my family for their support through this process. Let's make this season special. Go Knights!" The announcement came on the first day of classes at Rutgers and the team’s winter conditioning program and a day after the deadline for early enrollees to declare for the NFL Draft. It ends month-long speculation of his future that began following the Desmond King stomp on his ankle that ended his senior campaign. Grant returns as the program’s all-time leader in kick-off return yardage with 2,606 in 103 attempts, and his eight combined kick-off/punt return touchdowns is tied for the most in NCAA history. A weapon on special teams, it will be on the offensive side of the ball where Grant will be of most use for Jerry Kill, Rutgers’ newly named offensive coordinator and the ninth in as many years for Rutgers. Grant did it all for the Knights last season, from receiving bubble screens to taking handoffs on jet sweeps to running and even throwing the ball out of the wildcat. He accounted for six touchdowns last season — three rushing, two on special teams in the return game and one through the air when he tossed a 7-yard pass to Andre Patton against New Mexico. Despite playing a third of the season, Grant led the Knights in punt-return yardage and rushing touchdowns while finishing third in receiving yards and fifth in rushing yards. Taking over a unit that finished dead-last in the country in total offense, penultimate in scoring offense and in the bottom 10 in passing, Kill will be happy to hear Grant is back in the fold. "There's no question we need a guy like that," Kill said of Grant in a media roundtable last week before Grant’s decision was made. "We need playmakers. That's the first thing … Guys that can run. … We need those type of guys, and we can't afford to lose any playmakers right now." The decision to come to Rutgers was weighed against the possibility of forgoing his fifth and final year and entering the NFL Draft, where ESPN’s Mel Kiper Jr. believed he would land in the fifth-to-seventh round if he could remain healthy, according to NJ Advanced Media. Instead, he elected to return to Piscataway for one last ride around the Big Ten. If all goes as planned until National Signing Day, though, this time he’ll be surrounded by more talent than he had last year, at least on paper. With classmates Patton and Carlton Agudosi graduating, there will be open spots on the depth chart to be filled and many unknowns available to fill them. Ash, Kill and wide receivers coach Jafar Williams have only seen Grant and rising sophomore Jawuan Harris, the two-sport star who performed in his place following the injury, take the field for Rutgers in a game. Michigan transfer Ahmir Mitchell practiced with the team but was unable to play due to NCAA transfer rules. His brother Damon, a graduate transfer from Arkansas, has just six catches for 84 yards in his three years in Fayetteville. Current verbal commits Melton, a four-star recruit according to Scout.com, three-star prospect Shameen Jones and two-star recruit Everett Wormley all look promising, but whether they could transfer the talent to a stage as big as Big Ten football won’t be known until October. Among all these uncertainties is one undeniable truth — when the ball is kicked off by the opposition at High Point Solutions Stadium next fall, the fans in the stand will hold their breath as they wait to see what No. 1 will do with the ball in his hands.